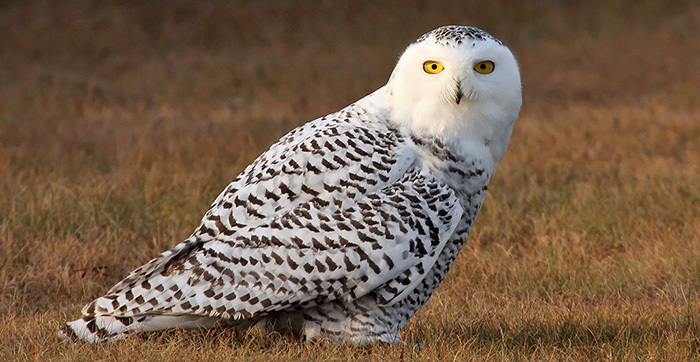 Snowy owls rank among the most charismatic wildlife species in the world. The heaviest of all North American owls, tipping the scales at 3 to 6 pounds, their bright white plumage, large yellow eyes, massive feathered feet and diurnal tendencies appeal to even the most casual nature lover. Equally appealing to some are their unpredictable movement patterns and the remote arctic wilderness they represent. As their name suggests snowy owls are generally a northern species, nesting worldwide on the treeless tundra above the Arctic Circle. During a typical winter some remain close to their breeding areas while others head south into southern Canada and the northern United States. At least small numbers reach Wisconsin each year. Every handful of years, however, large numbers move into the state, an event known as an “irruption”. Learn about the Snowy Owls visiting Wisconsin.